Infinite Art Tournament: Acquisition & Divestiture -- with FREE BOX!!! I was at an estate sale this weekend and found some medium-good boring postcards. They weren't marked -- estate sale faux pas, in my humble opinion -- but when I ran down the owner he carefully counted them up before announcing they were $2.00 apiece. $2.00 apiece! You know what Michael5000 does when you try to sell him old postcards for $2.00 apiece? HE LAUGHS IN YOUR FACE, that's what! Albeit civilly. Oddly, the guy let go of this 1941 map, which you could probably squeeze ten or twenty bucks from in the right situation, for a measly dollar! 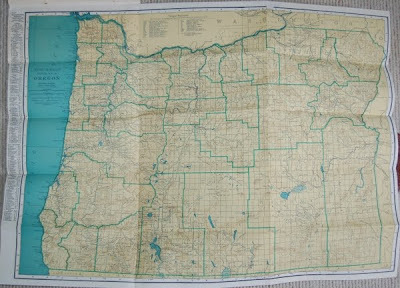 It's not quite like anything else in my vintage map collection! 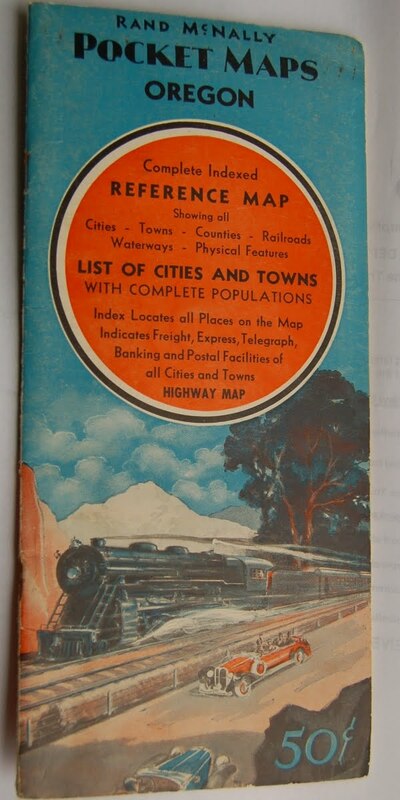 It's not a road map so much as a page from the old Rand McNally Commercial atlases, folded up inside a booklet along with an exhaustive gazetteer. 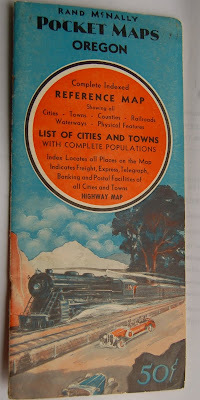 Just the thing for the travelling businessman who visits a lot of obscure rural communities, in 1941. Hey, Pop! 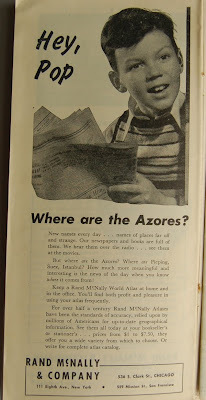 "Where are the Azores?" the ad text asks. 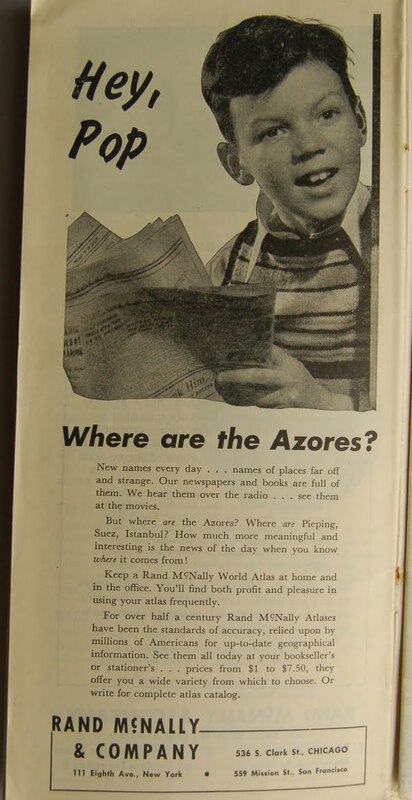 "Where are Pieping, Suez, Istanbul?" I mean, really? When you think about it? This is heady existential stuff. Meanwhile, in a nearby Free Box, I found this perfectly unremarkable 2002 map of Seattle, which will be a modest improvement on the 1999 map of Seattle that has been in my truck's glove compartment. Here are some items that we, the 5000s, are finished with and ready to divest of. Want 'em? As a member of the L&TM5K community, you get first dibs! First come first serve! Postage paid by us where reasonable! An old-school military-style duffel bag, olive drab. The two quilting hoops that no one wanted when I mentioned them here. CD: Lalo, Symphonie espagnole. Anne-Sophie Mutter, soloist. EMI Classics. CD: Mary-Chapin Carpenter, Come On Come On. CD: Camera Obscura, Underachievers Please Try Harder, not exactly a store-bought copy. CD: Russian Folk Songs. The Patriarchal Choir of Moscow. Naxos. CD: U2, All That You Can't Leave Behind. CD: Professor Longhair, Crawfish Fiesta. Caveat Emptor: his hair is actually not especially long. CD: Britten, A Ceremony of Carols, Friday Afternoons, others. New London Children's Choir. Naxos. CD: Elgar, Violin Concerto. Nigel Kennedy, soloist. EMI Classics. Old-style "UO" logo enamel University of Oregon keychain. One of those little compasses you stick on your dashboard, with two ineffectual suction cups. One computer keyboard, still in box. Three (3) irons, all three of which leak water but which work just fine as non-steam irons. Nice poster-sized National Geographic map of the world, folded. 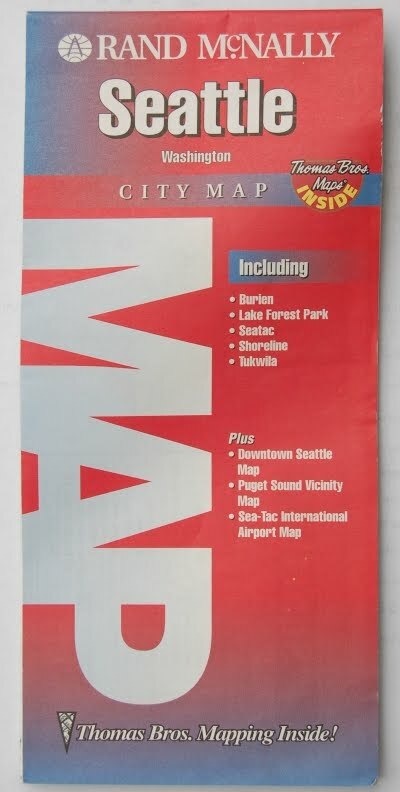 The 1999 map of Seattle that has been in my glove compartment hitherto. Book: Peter Hoeg, Smilla's Sense of Snow. Hardback First Edition, excellent condition, not worth much. Caveat Emptor: this is one seriously disappointing book. Book: Octavia Butler, Kindred. Trade Paperback. Last but not least: Great Expectations (by Charles Dickens, duh), unabridged, on 13 cassettes. Awesome reading of an awesome book, and I bet you still have a tape player somewhere around the house, don't ya. That's all for this time. Don't be shy! Everything must go! I'll second the thumbs up on the Great Expectations tapes. PS For those of you who have never lived with a quilter--you wouldn't believe how much ironing is involved! mrs.5000- My mom made a few quilts when I was a teenager and the ironing part of it was exactly what put me off ever taking it up as a hobby. Hand up for the Lalo, Britten, and Elgar CDs. But I would like to reimburse you on the postage. Have all the irons and quilting hoops I need, but are you interested in a three-rail floor frame for hand quilting? or a John Flynn set-up for machine quilting? Oh man, a free box! I'd definitely be in the running for the keychain (the letters UO have special significance to me) and the Russian folk songs (I'm always looking for nice background music). I could also take a poke on a couple of other items but I might leave them and see if anyone else claims them first. Postage to me here in Australia is a bit of a killer, so I'd like to pay it. Well, I for one would be interested in the Mary Chapin Carpenter and John Mayer CDs ... and possible Professor Longhair. There's nothing worse than a garage sale where the people holding it think they can, you know, make money. I haven't read all the comments (bad!) but that Great Expectations set sounds pretty enticing for a few reasons. We have a long drive to Idaho coming up. I'm dating myself, but my car only has a tape player! I'll take the duffel bag, please! Everything will be vouchsafed! Eventually! I feel that I should mention that my CD and keyring arrived a couple of weeks ago. Sorry I've been lax in letting you know. The keyring immediately earned pride of place on my housekeys, and the Russian Folk Music drove my brother to buy me a new set of headphones. Also in the CD case was waht appears to be the Russian Patriarchal Choirs interpretation of Led Zeppelin, the resemblence is so uncanny one could almost say it was recorded by the band itself, not the RPC at all! Did you mean to send me this second CD along with the first?